What it’s about: Tinseltown! The dream factory! The magic store! West Glendale! That screwy, ballyhooed Hollywood is famous for thrilling audiences, making nobodies into stars, and of course running long and going way, way over budget. While throwing a little extra money onto the screen is a tradition as old as rolling out the red carpet at the premiere, certain movies have gone above and beyond when it comes to spending the old do-re-mi, becoming more infamous for their budgets than for their star power. Strangest fact: Animation can get expensive. High on the adjusted-for-inflation list is Tangled (#5), Toy Story 3 (#33), Cars 2 (#36), Monsters University (#46), and The Polar Express (tied for #50). While animated features avoid the expenses of location shooting, and can often pay their actors less—as voice acting takes less time and can be done from anywhere—animation itself is a painstaking process that can take lots of skilled labor, not to mention computer processing power: Tangled combined traditional and computer-generated animation to create a painterly look for the film—the process took six years, which no doubt contributed to the expense. Biggest controversy: Of all the films to hold the title of “most expensive of all time,” the one to hold the record the longest may have been the most infamous production on the list. 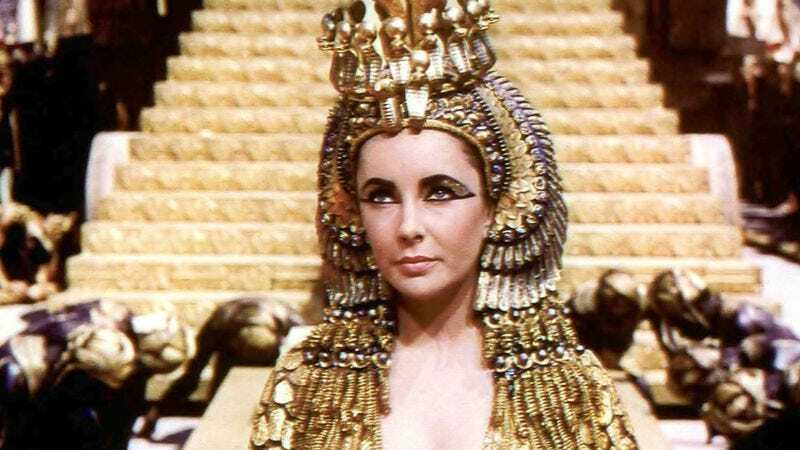 1963’s Cleopatra was a disastrous production, as director, cast, and location were all changed mid-shoot. Most of the sets had to be destroyed and rebuilt, and most of the logistically challenging epic was filmed without a shooting script. At the time, news of cost overruns (which nearly bankrupted 20th Century Fox) was second only to news of the romance between its stars, Elizabeth Taylor and Richard Burton, who each left their spouses to marry each other the following year. They were married for 10 years (an eternity by either actor’s standards), divorced in 1974, remarried in 1975, and re-divorced in 1976. The film won four Academy Awards, but got mixed reviews, and to date is still the only movie to be the top-grossing film of the year and still lose money. It remained the top-grossing film of all time for 15 years, until it was knocked of by an expensive success: 1978’s Superman. Two people could have easily fit on that giant piece of wood. Thing we were unhappiest to learn: Between foreign rights and DVD/streaming sales, blockbusters nearly earn back even the biggest budgets, but that wasn’t always so. 1925’s Ben-Hur (not to be confused with the 1959 version that starred Charlton Heston) was plagued with on-set difficulties, from accidents, to re-casting, to the logistics of shooting the film’s famous chariot race (which took 200,000 feet of film, less than half a percent of which ended up being used). The costs ballooned to $3.9 million ($53 million in today’s money, and more than two and a half times more expensive than the previous record holder, The Ten Commandments (1923), also later remade with Heston). Even though Ben-Hur was a huge critical and commercial success, it lost money, and only broke even on subsequent re-releases. Also noteworthy: Overspending on film production is as American as apple pie. There’s a list of most expensive non-English-language films, and it pales in comparison. Wikipedia lists 90 American films costing $155 million or more, while the most expensive non-English film of all time was Asterix At The Olympic Games, a French film based on the popular comic, that cost $113 million back in 2008 (and received the Gérard Du Cinéma, France’s equivalent to the Razzie). Asterix is part of a series, with five entries in the top 20 most expensive foreign films. China rounds out most of the rest of the top 20, with The Flowers Of War, Red Cliff, The Monkey King, The Monkey King 2, Dragon Blade, The Bombing, and Journey To The West each costing more than $60 million. Despite having the world’s largest film industry, India only makes one appearance on the list: this year’s $40 million Baahubali, although the list of most expensive Indian films lists it as two films, shot back-to-back. A few foreign language American films also make the list, including Steven Soderbergh’s Che and Mel Gibson’s The Passion Of The Christ and Apocalypto. Further down the wormhole: Ben-Hur wasn’t definitively knocked off the top spot on the list for 21 years, when 1946’s Duel In The Sun was made for a princely sum of over $5.25 million. But there were a few contenders in the interim that claimed to top Ben-Hur’s $3.97 million price tag. Gone With The Wind (still the highest-grossing film of all time, adjusted for inflation) cost somewhere between $3.9 and $4.25 million, making it unclear whether it topped Hur. And 1930’s WWI drama Hell’s Angels claimed to cost $4 million, but it was in fact made for less than $3 million, and the inflated price tag was a publicity stunt by its director, Howard Hughes. The legendary aviator, inventor, hotel magnate, and recluse started out as a producer and director in Hollywood, and we’ll look at his varied and colorful life and career next week.